Scented Silica Gel can last up to 1 year, and varies depending on your conditions. 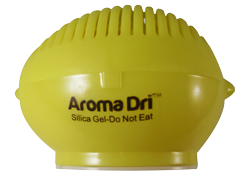 Aroma Dri™ Lemonade Scented Moisture Absorbing Hard Plastic Lemon Shaped Container Is Compact, Rugged, Portable, & Electric Free (NO CORDS)! Utilizing our top of the line Scented Silica Gel inside a compact and portable hard plastic canister makes it one of the most versatile fragrant desiccant products on the market! This fragrant Silica Gel is not reusable or moisture indicating. Perfect to use in bathrooms, under sinks, cabinets, closets, shoes, etc. to help fight moisture issues while refreshing the area. 3 " x 2 " x 2 1/2"